I've written previously about the handy Micro Four Thirds (MFT) format cameras, first in an Introduction and then a three part review of the Olympus E-P1 (Part One, Part Two, Part Three). In this article I'll answer the question "which Olympus PEN should I get?" by comparing the seven different models released since July 2009. There are plenty of other sites with exhaustive feature lists, comparison charts, and analyses. Here I'll attempt a summary. I won't cover the ten MFT cameras Panasonic has released, since I prefer the Olympus bodies for their built in stabilisation (IBIS) and cool retro look. Panasonic has certain advantages for video but that is not my primary interest. Olympus is on the cusp of releasing the first significant technological improvement to their mirrorless cameras, with the announcement of the first in the OM-D line, the E-M5. Now might well be a good time to pick up a PEN at a great price, either on the used market, or availing of manufacturer rebates. All of the PENs use the same 12.3 megapixel sensor and can access the same lenses. They are fundamentally similar in image quality and usability, but the little differences matter. There are three "lines" within the PEN system. The top line is occupied by the E-P1, E-P2, and E-P3, each model adding further refinements and features to the previous. The second line include the "light" models: E-PL1, E-PL2, and E-PL3. And the third line is the single "mini" model, the E-PM1. These cameras exclusively offers the dual dial control system: thumb dial and circular wheel. This provides the best ergonomics for those who like to shoot in Manual mode, Aperture priority mode with a contemporary lens, or for those photographers who need to change parameters often. The thumb dial is conveniently located and easier to use than the wheel. 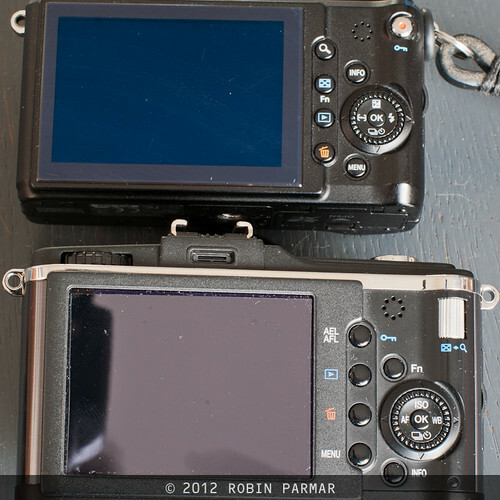 You can see it on the picture above, which compares the E-PL2 (left) with the E-P2 (right). It's the silver nubbin that fits right under where your right-hand thumb holds the back panel. On the E-PL2 this position is occupied by the direct video button. I used to think that the two dial system was essential for me, but I was wrong, for the simple reason that I favour using manual lenses with aperture rings. Using these in A mode, the lens controls the aperture, after which the camera automatically meters the light and sets the shutter speed. One control dial is all you need to dial in exposure compensation, as necessary. For contemporary lenses without aperture rings, you can toggle between setting aperture and EV comp with a press on the upper button of the rosette. This is marginally less convenient. Make your decision based on which lenses and which shooting modes you prefer. 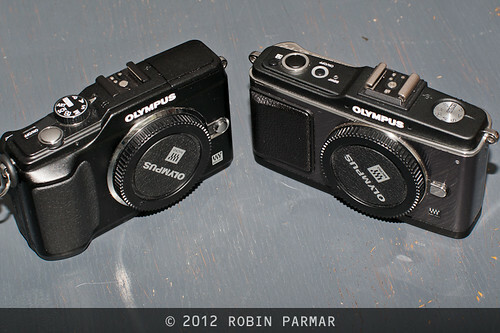 I would definitely have preferred if Olympus had dropped the dial and kept the thumb wheel on the less expensive units. On my E-P2 I turn off the rosette altogether, as it just gets in my way. But instead Olympus did the opposite. Oh well. I will point out that only the E-P1/2/3 models have an orientation sensor, a fairly cheap decision on the part of Olympus. This means that portrait-oriented shots taken with the other cameras have to be manually rotated. The E-P1 is already an excellent little camera (see my review), but I would only buy it if you have the tightest budget. The second model, the E-P2, is almost identical but adds manual control of video shooting and one very important physical feature: a port that allows you to attach an electronic viewfinder (EVF) to the hot shoe. The E-P2 is worth the incremental price difference for that alone, so long as you are also budgeting the couple hundred clams for the VF-2 model EVF. And you should, since this changes the operation of the PEN from a clunky "hold it at arms length while staring at the screen" to the SLR ergonomics of "brace it against you while looking through the viewfinder". Once you have the EVF, it can slot into any of the models except the lowly E-P1, even the upcoming OM-D. So you can carry one viewfinder even if switching between bodies. That's the advantage of a modular system. 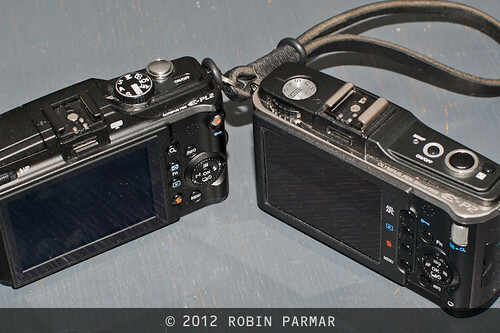 I've not long reviewed the EVF in a two part article, so link through for more details. All three "light" models lack the thumb wheel and are a little smaller and lighter than the top line, though not enough to make a real difference. The button layout includes dedicated video and magnify buttons, though the highly detailed configuration system lets you redefine them to other functions (exposure lock, for example). Comparing the pictures, you will find exactly the same number of buttons on the E-PL2 as on the E-P2, though the latter model hides one on the top panel. The E-PL1 has a noticeably cheaper build quality than the other models, a minimal grip, and is the only model to have no dial at all (changes must be made using buttons). The main feature improvement is a built-in flash. Of course this not very powerful, but still handy for fill-in use. It can also be used as a radio controller for Olympus flash pots, or as an optical trigger for those flash units that support being a slave. A built-in flash is important if the hot shoe is occupied by the EVF; you can still use flash and viewfinder at the same time. I can't recommend the E-PL1 since the E-PL2 offers so much more. The buttons are repositioned more like the E-P1/2/3, though as you can see from above, there are still many differences. This is a pet peeve of mine. I sure wish Olympus would leave the buttons where they are! That way, once I had learned one camera I could use another with no retraining. Instead, they seem to delight in making completely arbitrary changes with each new model. The build is improved, becoming once again similar to the top-end units. In fact, the grip is significantly better than the E-P1/2, providing a nice solid and textured surface. The E-P2 has an LCD with twice as many pixels for clearer images (especially when zoomed). It retains the built-in flash of its predecessor. Even the image quality benefits from slightly improved noise reduction algorithms and a weaker anti-aliasing filter (introduced with the E-PL1). This should result in sharper pictures, a claim I will test in my next article. Another little thing I like is that the power button is recessed into the casing, making it impossible to accidentally trigger. And the power light is much smaller. Whereas it's a big blue ring around the button on the E-P2, here it's a tiny dot that I cover with gaffer tape (I really hate stray light when I'm shooting in dark venues). Confusingly, the E-PL3 is not much like its predecessor, lacking the built-in flash and having a wimpy grip. Instead, it's similar to the tiny E-PM1, which has the fewest controls and most toy-like appearance of any PEN. Both come with a clip-on flash and share certain upgrades that will be appealing to many buyers. Video is now 1080p and the burst shooting rate is 5.5fps. Performance is overall snappier thanks to a faster processor. The high ISO limit has been increased a stop to 12800. The E-PL3 is notable for being the only PEN with a tilting LCD. The E-PM1 is notable for being, well, really small. I'd consider that a detriment, since there is a limit to how small a camera can be and remain usable. But it's amazing that there is no IQ or feature penalty for this miniaturisation. The E-P3 is the most recent PEN model, incorporating all the performance enhancements of the smaller units, except the new burst rate (an odd omission). The built-in flash from the E-PL1/2 makes a welcome re-appearance. The E-P3 upgrades the LCD to 614K, which additionally is touch sensitive. (Some like that kind of thing.) The screen is not hinged, however. The latest three models (E-PL3, E-PM1, E-P3) have in common an AF assist light, which can help get focus even in low light. The downside is that you'll be beaming out light over your subjects, something they may not appreciate. It is good to remember than the most recent cameras are the most expensive and, though they offer more features, may not give you better images or a better shooting experience. If you need to choose between the VF-2 or a more expensive camera body, buy the viewfinder! * Need the smallest possible camera, loaded with features, and don't mind the ergonomic penalty? E-PM1. * Need a tilt LCD? E-PL3. * Want a built-in flash? E-PL2 or E-P3. * Require two controllers or the orientation sensor? E-P1/2/3 depending on your other requirements. * Need the best video with stereo mics? E-PL3, E-PM1, or E-P3. * Want a decent grip so you don't drop the darned thing? E-PL2 or E-P3 (though E-P1/2 are OK as well). * Need improved image quality? E-PL2, E-PL3, E-PM1, or E-P3. In my next article I'll try to determine if this last claim is true. I made a few updates and added section headers. Added info on AF assist. Hey, I just want to mention there exist 3rd party hand grips for the models that doesn't have one. I'm going to get the E=PM1, and for 35$ I'll get a custom grip on it. And I'll get the E-PM1 refurbished for 299$, so it's well worth it.